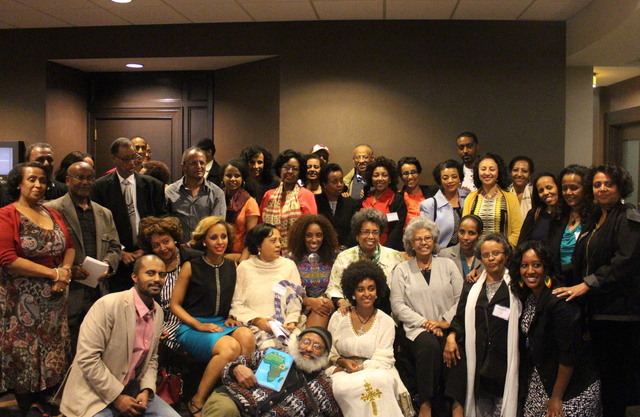 Washington, D.C. (TADIAS) — The lively and diverse crowd at the Third International Conference of Ethiopian Women in the Diaspora — that was held at the Sheraton in Silver Spring, Maryland this past weekend (Saturday, March 22nd) — featured several speakers (both women and men) discussing current issues affecting Ethiopian women globally. Some of the presenters participated via Internet from Colorado, Kentucky and California. Speaking of Helen Afework, a young researcher and a graduate student at the European Masters in Migration Studies in Germany who is currently in New York on a fellowship program at the National Domestic Workers Association to study domestic workers in the United States, Dr. Maigenet said she became the recipient of the 2014 CREW scholarship sponsored by Tsehai Publishers. Tadella Fanta, a gender specialist with many years of experience in Ethiopia and other countries, addressed “the gendered nature of migration” based on research she had conducted regarding Ethiopian migrant workers in Yemen and Sudan. “She is one of the founding members of CREW, which has provided her a platform to present her research papers,” Dr. Maigenet said. Dr. Maigenet noted that “a lot of people inquired later about how we brought all these dynamic young professionals and senior scholars [together],” Dr. Maigenet said. “It was through contacts from the National Press Club roundtable that was organized by Tadias Magazine in December 2013 where we were introduced to a number of the panelists.” Dr. Maigenet also thanked additional media sponsor ESAT television and radio and CREW member Birtwait Girmay who is a producer, Voice of America (VOA) Amharic Service, Netsanet LeEthiopia radio, Addis Dimtse Radio, and ECADForum. CREW looks forward to hosting a fundraising event in May.